Excellent resource on the use of herbs including contraindications of using herbs with prescriptions and even with other herbs, case studies, full color images, botanical and common names as well as indication and usage. A must have for both the budding herbalist and the Master Herbalist alike! This is an excellent guide for finding warnings and information regarding the safety of various herbs. Listed by both botanical name and common name with an easy to use index this is an invaluable resource for the at-home herbalist, the practitioner treating patients and even manufacturing companies use it to help with label warnings. This was the first book on thyroid issues I read that actually went in depth on autoimmune disorders, what tests you should have done, how to understand their results, and what to do about the results. An excellent in-depth read and one I consider to be an invaluable resource. I am using this cookbook to follow the “elimination” portion of the elimination/provocation diet Dr. Kharazzian explains in his book. There is an excellent listing at the beginning of the book of foods to avoid, as well as a listing of foods to eat (which was surprisingly long after reading everything I would need to avoid – LOL!). There are two different complete 4-week Meal Plans with shopping lists too! I have tried many recipes out of this little gem and have several favorites! The Fig Energy Bites have been made multiple times, and so has the cauliflower fried “rice”. The coconut crusted cod was lovely as well! Definitely an excellent tool for those looking to use AIP Paleo for their elimination phase! also known as the “Phoenix Helix”, is an excellent PDF eBook guide to the methods used for reintroducing foods after being on the AIP Paleo Diet (the “Provocation” phase). There is a method to the madness! 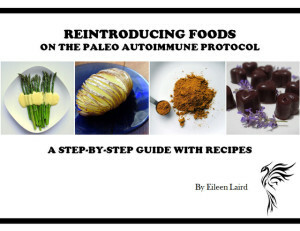 Eileen includes information on how to know when you’re ready to try reintroducing foods, what order to reintroduce foods in, and even a recipes section to help you out with ideas on how to prepare the food! Thank you Eileen for this excellent resource!